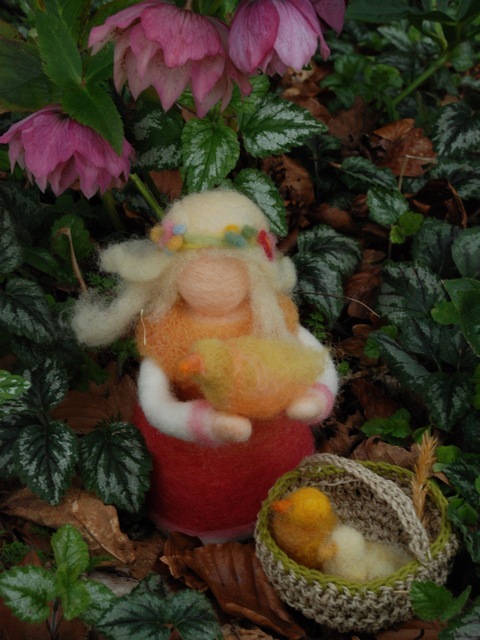 Before it feels like Spring has finally bowed her head to Summer, I wanted to share some felted pieces that I made in honour of springtime. I recall having a nature table in primary school and I clearly remember being captivated by the birds nest it held. The value of bringing the outside in, to the classroom or home is significant, particularly in more urban environments. 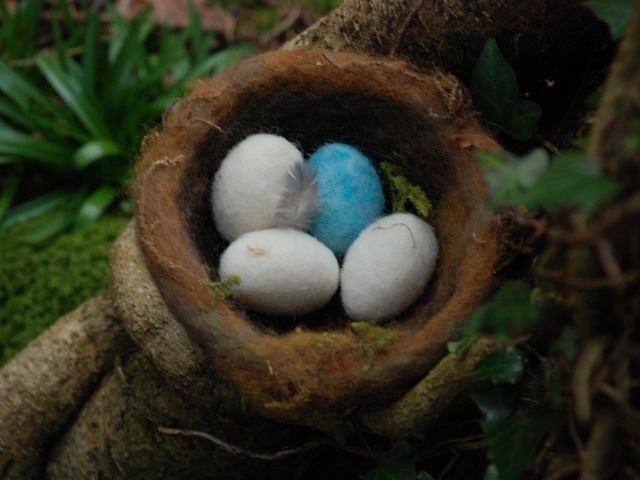 Children love to gather natural treasures and put them in a special place, like a seasonal table, to remind them of that special walk, what's currently growing or changing in nature and the colours or creatures we associate with that time of year. Symbolic figures such as these reflect the changing seasons outside and welcome in the new. 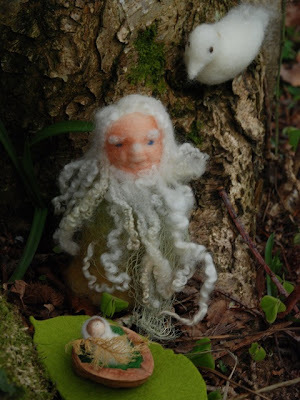 The figures have real presence, are sturdy enough for gentle play by older children and are ideal as central figures in puppet plays and storytelling. 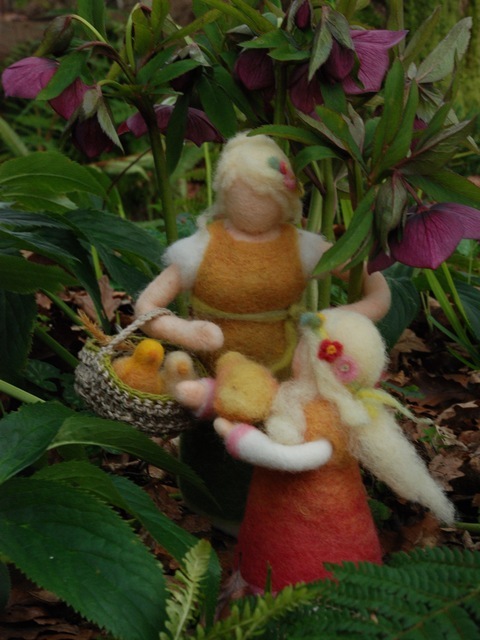 Lady Spring's basket I made from hemp, I felted with undyed and plant-dyed wool. 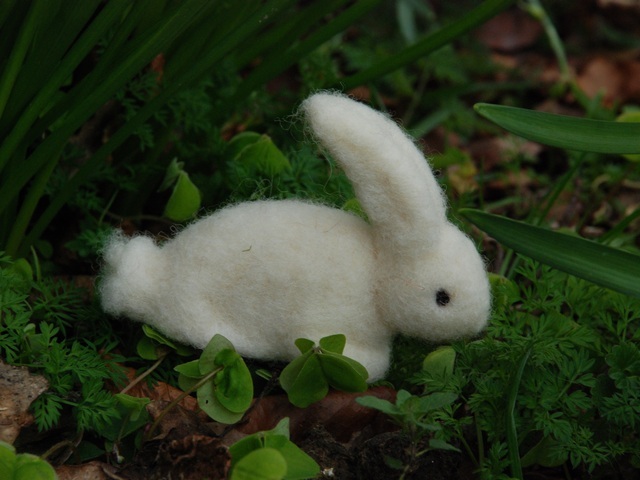 I tell you, working with plant-dyed is a whole other level of experience as a feltmaker. Every time I use it I swear I don't want to work with any other kind of wool. It is quite literallyalive and you can feel the energy of that in your hands as you work with it. It's also to do with the very subtle qualities of the colours. 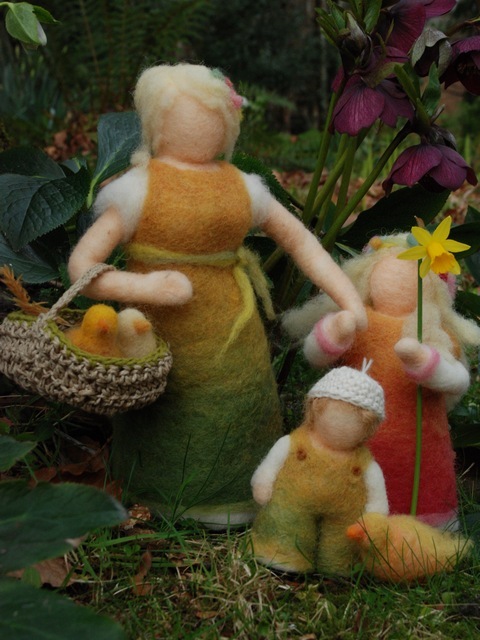 These needle felted figures are made without any sewing, gluing or patterns, I work from my head. And why I love it..? They are100% Wool. I can take it absolutely anywhere when I'm working on it, (and I do! )without having to think about access to water. There's no clean-up after a work session and I can put it down and pick it up at will. In other words, it's perfect if you have a family, small children. I find I can do it right there at my kitchen table, in between getting up to stir the soup, or soothing my small boy's latest injury ; ) And I love the sound of it, of the fibres entangling with every stroke of the needle. Three-dimensional work was not a strength for me at art college and as I have mostly worked in two dimensions, I've found that the soft sculpture work really has developed my sense of that, and brought me on in ways I didn't expect. I cherish the way handwork can make you feel like you're making something (quite special) out of nothing. It is just so with this process, you start out with tufts of coloured fluff and end up with a figure you can hold and place, and look to. Enchanting, no? Oh absolutely enchanting. I remember our nature table vividly and I loved it. Everything on there was a treasure, cones, Autumn leaves, birds nests of course. Hips, acorns - such delights. I still collect feathers even now! Your figures are just amazing and I can't wait to learn how to play.